Discover China's greatest sights including the Great Wall, Tiananmen Square, the Terracotta Warriors and the bright lights of Shanghai. Travelling in between each great Chinese city we get to meet local people as we journey on public transport including China's vast railway network. Arrive in Beijing and check-in to the hotel. Beijing is the political and cultural centre of this vast country. This morning you will have a guided tour of Tienanmen Square and the iconic Forbidden City, the one-time home of the Ming and the Manchu (Qing) emperors and the largest and best preserved collection of ancient buildings in the whole of China. The afternoon is left free to visit the Temple of Heaven or just walk through the famous Beijing Hutongs, narrow alleys formed by traditional 'siheyuan' courtyard residences. It's a busy day today as we drive out of the city to Mutianyu to visit the Great Wall. Its construction commenced in the 3rd century BC by Shi Huangdi, thousands of conscripted workers laboured on it and many lie buried in its brick and stone ramparts. Returning to Beijing we are scheduled to leave the city this evening on the sleeper train. The main railway station is a hive of activity. We arrive in Xian in time for breakfast. We make the short journey from the train station on foot. Our stay in Xian reveals the extraordinary continuity of Chinese civilisation. Xian (Changan) served 11 dynasties and was the very starting point of the Silk Road between Central Asia and Europe. Its ancient monuments include the Great Mosque, a wonderful 15th century working mosque within the old muslim Hui District. There is also the option to visit the Big Wild Goose Pagoda, a 7-storey high structure with a superb overview of the city. Today we take the public bus and visit one of the highlights of any visit to China - the magnificent Terracotta Warriors and Horses who guard the Qin Shi Huangdi Tomb. There are literally thousands of lifesize warriors, dating from 200BC. This dramatic find of the 1970s is considered one of the greatest archaeological discoveries of the century. We should have time to stop at the on-site factory to see how the warriors are made today. In the early evening we take the overnight sleeper train to Suzhou. Suzhou sits astride the Grand Canal which was completed in 610AD and linking the Yellow River with the Yangtse, and Beijing with Hangzhou, the 1,800 km Grand Canal was a magnificent engineering feat. Over the centuries it has transported food north from the fertile lands in the south. Over 2,500 years old, Suzhou is sometimes called the 'Venice of the Orient' with a series of bridges, canals and ancient buildings. But a little of Suzhou's special magic lies in its famous gardens, perhaps the most beautiful in all China. This afternoon we have time to explore this lovely old town with the option to take boat ride on the pretty canals or visit to the large 'Humble Administrator's Garden' which has streams, ponds and beautifully decorated pavilions scattered throughout. Here water reflects land and provides a fresh tableau at every turn. We continue our exploration of the town. There is time to make an optional visit to the 'Lingering Garden' which features a man-made mountain and lake, garden courts and elegant buildings, a real contrast to the garden from yesterday. Early afternoon we catch the train to Shanghai. Shanghai is one of Asia's most vibrant and dynamic cities. It began as a fishing village in the 11th century, but after the end of the first opium war and of the five newly opened treaty ports Shanghai soon became the most cosmopolitan city, with Asian, Russian, European and Jewish influences. Here were cabarets and ballrooms, fine shops and satirical newspapers, and with such style and influence Shanghai was dubbed the \ Paris of the Orient\ . Today its elegant past is still noticeable as you walk down 'the Bund\ . Time in Shanghai is left free for your own exploration. You may wish to visit the 16th century Yu Yuan Gardens or stroll along the Bund. Our tour ends this morning. Please note that luggage space on the sleeper trains is limited. Bags are stored either under the bottom bunk or in an overhead section at the end of each berth. Soft bags are more suitable for train travel in China. You will need to carry your own luggage at train stations so please bear this in mind when packing. During the tour we spend two nights on overnight sleeper trains. These are a great way of travelling between cities without losing precious time in the day for exploring with the added bonus that we will get to meet locals as we travel. We use cabins with six bunk beds, three on either side. There are curtains at the end of the cabin for privacy. There is space in each cabin for bags, under the bottom bunk. We suggest a soft duffle style bag or a rucksack as they offer more flexibility than a suitcase.There are toilets in each train carriage, usually Asian style squat toilets although some trains do now have a western style toilet as well. We are likely to be sharing our cabins with non Explore travellers giving us plenty of time to learn about local life during the journey. 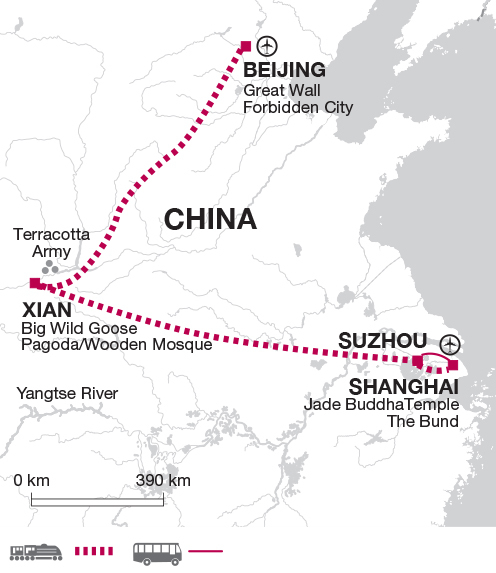 This short tour is a great insight into China and explores the main highlights. It is ideal for travellers who are interested in culture as well as experiencing the busy cities including Beijing and Shanghai. You have the chance to stay on two overnight trains and really experience the China lifestyle.